These Mason Jars are for the Birds . . .
Just fill this rustic jar feeder with bird seed, and soon you'll be enjoying feathered company. Adds charm to any landscape. 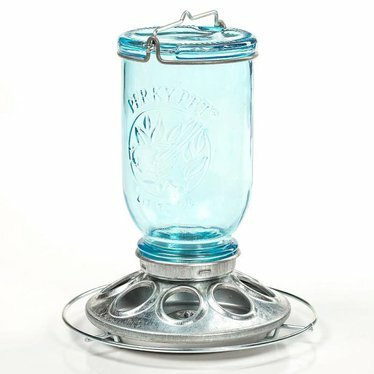 Tinted-blue jar has an antique look. Metal base provides feeding ports and circular perch. Note: You supply bird seed. Twist jar to remove and fill. Eight oval feeding ports. Mason Jar Wild Bird Feeder These Mason Jars are for the Birds . . .